The underlying assumption of Adventism is that the purity of first century Christianity was soon lost only to be partially restored during the Protestant Reformation with Seventh-day Adventism being a fuller return to the roots of early Christianity. Orthodox evangelical Christianity insists that an individual can only resolve these controversies through the personal leading of the Holy Spirit with the Bible as the only source for knowing and understanding God’s written inspired truth. We are to no longer teach the commandments of God from within the framework of the Old Covenant Mosaic Law. Instead God’s eternal law is now written on the hearts of those who have been redeemed under the provisions of the New Covenant. The Epistle of James lays out what the world should be able to see in the behavior of New Covenant Believers who now have the law of God written on their hearts under the indwelling leading of the Holy Spirit. This was resolved during the early years of the Christian faith only to resurface again by the Seventh-day Adventist movement following the traumatic events of 1844. The Mosaic Law is the ‘law of sin and death’ we are no longer under. The ‘law of the Spirit’ sets us free from the ‘law of sin and death’. Since sin and death existed before the giving of the Mosaic Law which was given over four hundred years after the unconditional promises made to Abraham it should be obvious that sin and death could not be the transgression of law that didn’t yet exist, Gal. 3:17. 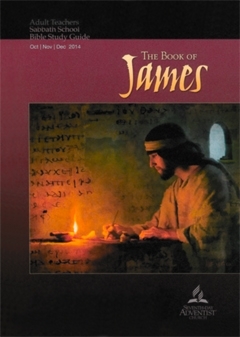 The identity of James, the author of the epistle of James, is the topic for today’s lesson. James would have had more educational opportunities than would a common peasant. James was probably the oldest son. His brothers were not Mary’s own children but the sons of Joseph by a previous marriage. While it is not in dispute that this particular James was the brother of our Savior Jesus Christ much of what is said in the lesson of who was are mere assumptions which are not supported by Scripture. Scripture, all Scripture and nothing but Scripture should be the foundation for this lesson. Scripture tells us nothing about the personal life of James other than he was one of the siblings of our Savior Jesus Christ. It is unethical and not appropriate to offer these kinds of speculations and imply that this is ‘bible study’. According to scripture Jesus was the ‘first born’ and oldest son of Joseph and Mary. Speculating anything else is unwarranted. Even though we have good reason to believe James was a younger half-brother to Jesus, James doesn’t even mention this in his epistle. The simple fact is that we have extremely little biographical information about James the brother of Jesus. We should avoid the practice of attempting to fill in what we really do not know with mere speculations. It is generally understood that, this James was the brother of our Savior Jesus Christ and the author of the Epistle of James. He was a Believer and a recognized leader of the Christian faith. The biblical passage in question, Acts 21:17-26, makes no mention of the offerings they (Paul and those who came with him) brought to the church in Judah. It is also uncertain as to who it was that arrived in Jerusalem with the Apostle Paul. The ‘we’ in verse 17 does indicate that the author of the Book of Acts, who is believed to have been Dr. Luke who wrote the Gospel of Luke, was one of those that was with Paul as this appears to be a ‘first person’ account. What is more troubling is that lessons such as this have been written under the guise of being ‘bible study’ but have included questionable non-biblical supporting references from someone who is known to have plagiarized her writing from non-inspired sources. Furthermore, this very same Council of Jerusalem (Acts 15:1-21) that Paul was standing before years earlier resolved the issue of whether or not Gentiles and Jews who worshiped in predominantly Gentile churches had any need to follow the commandments of God as they were expressed in the now obsolete Old Covenant Mosaic Law. Any conclusions we make concerning whether or not to pattern our lives after anything found within the Mosaic law of the Old Covenant as we study the Epistle of James must conform to what James said here to the Apostle Paul and those with him. The deception of the above quote is that even though one could agree with everything said it does not address the question of; what is true faith or what is the source of true faith? Yes, another person should be able to tell you are a Christian by the way you behave. Yet, it is certainly possible to behave ‘in the right way’ and not be in the kingdom of God. Jesus clearly said you must be “born again” (John 3:1-21) before you can join the kingdom of God. And, Jesus said that it is not possible for a sinner to do anything to cause this to happen. The outward demonstration of Christian living is the result of having true faith founded solely upon the gospel message of Jesus Christ and his gift of the indwelling Holy Spirit who causes our dead human spirit to be born again. James in this epistle does not define what the gospel is or how to become a true Believer since they are already Christians who don’t need to learn what they already know and have experienced in their own lives. At the times when the Apostle Paul appeared before the Council of Jerusalem, of which James was an important member, the Council fully supported the ministry and preaching of Paul. The Epistle of James simply puts forth practical advice on the conduct of those who are Jewish true Believers with the implication that Gentile Believers would do well to follow the same instructions. Speculation is made concerning the meaning of the phrase; “the twelve tribes” as in “the twelve tribes in the Dispersion”. The lesson phrase “so, “the twelve tribes” probably refers to Christians as a whole” is a bit of nonsense. While Gentile Christians can find much in this epistle to apply to their lives it was originally and Specificatlly addressed to the needs of Jewish Christians who have embarked upon a whole new way of living to encourage them in their New Covenant spiritual growth. In Scripture, both in the Old and New Testaments, it always uses this phrase to refer to the twelve tribes of promise of the nation of Israel. And, in the “Dispersion” could only refer to the Hebrew people scattered abroad from their homeland. The Gentiles were saved apart from being circumcised and keeping the Law of Moses. Peter declares none of the Hebrew people have ever been able to keep this law and he says even “we” (Jews) are saved in the very same as the Gentiles. God does not have a double standard. All those who are saved are saved for one reason only. Their sins have been covered by the blood of Jesus Christ, 1 Cor. 15:1-5 & Gal. 1:9. Today the Epistle of James is being compared to The Sermon on the Mount as recorded in the Gospel of Matthew by providing three sets of verses where we are expected to summarize the words of Jesus versus what is recorded by James. It is interesting how both Jesus and James said some of the same things however this is not a summary of what either Jesus or James had to say. A summary means to take into consideration everything thing said by both Jesus and James and then attempt to reduce their words into a short statement of what each is teaching. One should first analyze all of the major points found in the Sermon on the Mount before comparing that to what is recorded in the Epistle of James. We have reason to expect the teaching of Jesus and James to have important commonalities however this isn’t what is being accomplished. It would be like saying apricots and oranges have commonalities because they are both fruit and have the color of orange. Another person could respond by saying; “Well one has a center pit and the other has many seeds, so what”? The lesson author has the appearance of having an unstated agenda but does provide what appears to be a good reference for those who wish to pursue research on this theme. Instead of being a ‘further study’ of this week’s introduction to the Epistle of James today’s lesson focuses on a quote made by Ellen G. White. Please read this quote in the lesson and then compare it against what Scripture actually has to say. Then Jesus said; “Today this Scripture has been fulfilled in your hearing”, Luke 4:21. By this Jesus declared he was the Messiah. It was for saying this that he was rejected by the townspeople who attempted to throw him down a cliff. Scripture does not support the things Ellen White said about the brothers of Jesus. Scripture alone must be our source for knowing the inspired truth of God. Copyright 2014 BibleStudiesForAdventists.com. All rights reserved. Revised September 21, 2014. This website is published by Life Assurance Ministries, Camp Verde, Arizona, USA, the publisher of Proclamation! Magazine. Contact email: BibleStudiesForAdventists@gmail.com.